President Obama phoned the president of Pakistan on Sunday to offer “condolences” for the deaths of two dozen soldiers killed in NATO airstrikes along the Afghan border, the White House said. 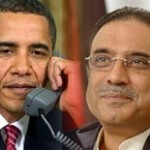 But Mr. Obama’s comments to President Asif Ali Zardari stopped short of a formal apology or a videotaped statement to ease the public anger in Pakistan. It may be added that the strikes on the two Pakistani outposts occurred during an operation by Afghan and American Special Forces against a Taliban training camp in a remote and mountainous border area, that killed 24 Pakistani soldiers.